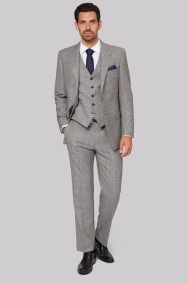 Make a sartorial statement with this classically elegant suit from our Savoy Taylors Guild range. 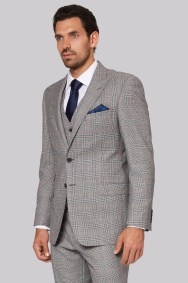 The suit's traditional tailoring is given a modern twist thanks to the contemporary black and white pattern with red check detailing. 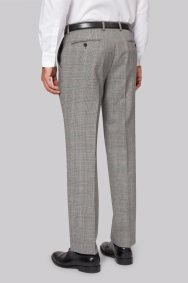 A ticket pocket and outer breast welt pocket add further interest, while the peak lapel injects even more sophistication. Combine with navy accessories for a bold colour contrast. 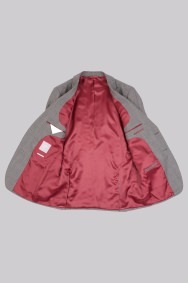 The relaxed cut of a regular fit jacket makes it easy to dress comfortably without compromising style. 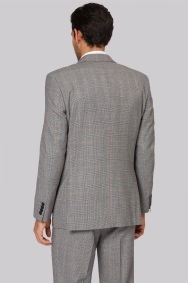 A smart regular fit jacket has more space around the chest and shoulders to allow you to move freely and stay crease-free from boardroom to bar. Pair with a regular fit shirt and trousers to create a relaxed ensemble. Not received yet so can't really say!! 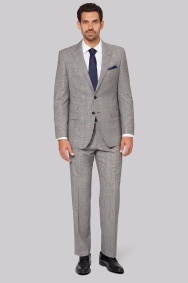 Looks and feels great - a sharp looking suit! the product quality and the manufacturing is very good. 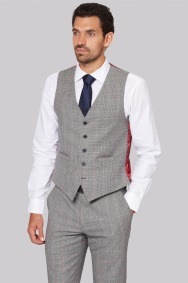 Great little suit for an event that I have in mind. Good fit as always. Trousers too wide at the bottom. High quality and nice colour. The suit is very good and tasteful. Great suits and looks great. Not a perfect fit, but as close as I normally get with off the peg! 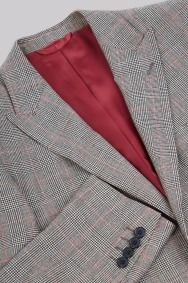 The quality is very good and for the price paid, unbelievable value for a work a day suit! Good service with the assistant going that extra mile. Could do with a little more room around the shoulder area for the guys that go to the gym. I'm a 50 short but need a little more room only around the shoulder area. He was very friendly and helpful. He delt with 4 of us and it was no problem for him at all. I am very pleased with my 100% wool Savoy Tailors Guild jacket. It is superbly styled with a contemporary yet classic look, and is an excellent fit. Service and the attention given can only be described as amazing.